Originally published in The American Prospect on March 2nd, 2015. 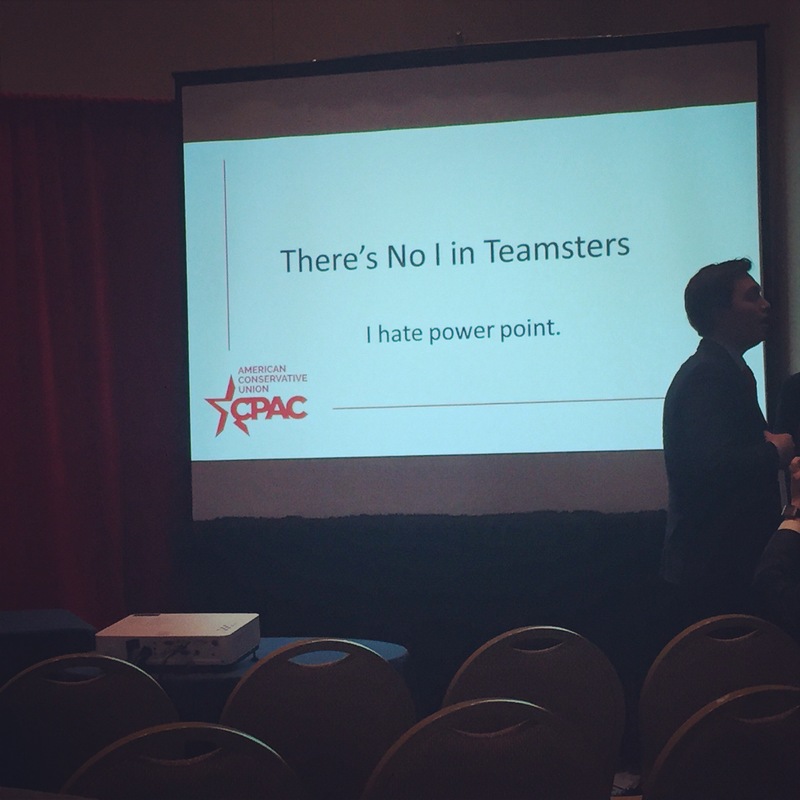 On February 26, day one of the Conservative Political Action Conference (CPAC) in National Harbor, Maryland, a panel convened on the state of the labor movement. To describe the tone of presenters as triumphant would be an understatement. At the Thursday afternoon breakout session titled “There’s No ‘I’ in Teamsters: Obama’s Bow to Big Labor Bosses,” panelists discussed a long list of topics, ranging from the salaries of top union leadership to “pernicious” attacks on franchisers of fast-food restaurants, whose workers have taken to the streets to demand predictable schedules and livable wages. Indeed the anti-labor forces represented here found much to be happy about, and the speakers could hardly contain their glee. “Labor policy is one area where our side is actually winning,” boasted Mark Mix, president of the National Right to Work Committee. To a large extent, their confidence is certainly justified. Mix was speaking less than 24 hours after the Wisconsin Senate passed a so-called right-to-work bill—legislation that would make it illegal to require that employees pay fees to unions, effectively hurting unions’ ability to bargain and organize. If, as he is expected to do, Governor Scott Walker signs the bill, Wisconsin will become the 25th U.S. state to enact such a law. But when it comes to the labor rights of domestic workers, the right’s self-assuredness at CPAC was overstated. If nothing else, its leaders’ intransigence against the rights of the largely female and non-white workforce in this sector is bound to hurt the image of the Republican Party, with which the anti-labor forces are allied. Tammy McCutchen, a CPAC panelist who formerly worked in the Department of Labor (DOL), accused the Obama administration of trying to “devastate the home care industry”—referring to the administration’s attempt to ensure that the nation’s more than two million domestic workers receive guaranteed overtime pay. Through an old provision in the Fair Labor Standards Act (FLSA) known as the “Companionship Services” exemption, domestic workers have been left out of the minimum wage and overtime pay protections that most other workers are entitled to. In 2013, the DOL announced that it would begin to extend FLSA protections to the majority of domestic workers. Though the start date was pushed back, the expanded protections are still expected to go into effect later this year. The median wage for domestic workers (also commonly referred to as home health and personal care aides) is $9.70 per hour. With an expected job growth of 70 percent between 2010 and 2020 as the baby-boom generation enters its golden years, domestic care is easily one of the fastest-growing industries in the nation. Low wages and minimal labor protections are an economic non-sequitur in a sector where demand is positioned to quickly outpace supply. In 2012, the National Domestic Workers Alliance (NDWA) published the first national survey of domestic workers in the U.S. It found that although domestic workers play an increasingly important role in the U.S. economy, their work is unregulated and highly prone to exploitation. Nearly a quarter of all workers were paid less than the state minimum wage, and 60 percent of workers reported spending over half their income on rent or mortgage payments. NDWA’s labor organizing has been gaining prominent recognition. In 2012, NDWA Director Ai-Jen Poo was named one of Time magazine’s 100 Most Influential People in the World, and in 2014 she was named a MacArthur Foundation Fellow to continue her work organizing domestic workers. But at CPAC, McCutchen didn’t mention any of this. She didn’t mention that the vast majority of the home care workers are women of color. She didn’t mention the historic Domestic Workers’ Bill of Rights that passed in New York, Hawaii and California. Instead, McCutchen pretended as though all the momentum in domestic labor organizing has come through the overreach of faceless bureaucrats in government agencies and from a power-hungry president. And she insisted that the regulations would greatly hurt the industry, leaving our aging parents to suffer. It’s unsurprising that labor-minded conservatives would be so proud of themselves at CPAC, what with union membership declining, and the recent spate of anti-union victories at the state level. But the right’s refusal to reckon with the growing domestic workers movement could come at a cost. As the Republican Party tries to improve its image among women and minorities—the very people who fill most low-wage jobs—doubling down on anti-worker policies will only dampen its appeal.